The other day in On Contemplative Spirituality And Charismania here at Apprising Ministries I explained once again what I mean by charismania. I’m using the word as an apt description of the excesses of hyper-charismatic practices a la what you see daily on the haven of heretics known as TBN. As I said one of the results of these heretical hyper-charismatic practices, along with its parallel track of Contemplative Spirituality/Mysticism (CSM), is a delusion concerning Christian unity. The adherents truly believe that God wants to unite all the various factions of the visible Christian church; including Rome. Allow me a couple of quick points; 1) I am a former Roman Catholic, and 2) after the Lord in His mercy saved me from that false religion, I was once in the Word Faith movement as a very young Christian. Therefore, I can tell you that the pope reached out to Copeland because he’s Kenneth Hagin’s successor as WF head. Then a couple of years ago, e.g. in Emerging Ecumenical Evangelephants And The Word Faith Movement, I warned you that the Elephant Room 2 (ER2) of James MacDonald and Mark Driscoll was like a nuclear explosion in the spirit world and the full effects of its silent shockwaves have yet to be fully realized. One was that ER2 was used to further mainstream Word Faith mogul T.D. Jakes and even his friend Joel Osteen. This has largely been accomplished through Osteen wannabe, prophet-pastor Steven Furtick; a veteran of both ER1 and 2 who’s developed Furtickism, see: Steven Furtick Debuts On TNB Amid Financial Concerns. So, what we’re witnessing now is mainstream evangelical megachurch pastors such as MacDonald, Driscoll, and Furtick, becoming unwitting dupes (at best) or willfully trying to help make Word Faith wingnuts legit (at worst). Then there’s Southern Baptists Assisting The Roman Catholic Church To Infiltrate Evangelicalism. Lord willing, I’ll have more on all of this later. But for now, it’s against this necessary backdrop that I now leave you with Ed Stetzer hosting the Praise the Lord (PtL) program of TBN last Friday night. You really need to realize here that PtL is the heart and soul ministry vehicle for this brood of vipers. Ed Stetzer, best-selling author and president of LifeWay Research, will be hosting Praise the Lord on Trinity Broadcasting Network (TBN), Friday, Jan. 10. A regular host of Praise the Lord, Stetzer will be joined by megachurch pastor Matt Chandler, who will tell the story of his brain tumor and God’s providence. Popular author, columnist, professor, and faith trends expert Ed Stetzer, a vice president at the Southern Baptist Convention’s Nashville-based Lifeway Christian Resources, will host a special live taping of the Trinity Broadcasting Network’s signature music and talk show “Praise the Lord” at Nashville’s famed Trinity Music City, Tuesday February 25th. The taping is open to the public. Stetzer is a scheduled keynote speaker at this year’s National Religious Broadcasters convention February 22nd through 25th in Nashville. 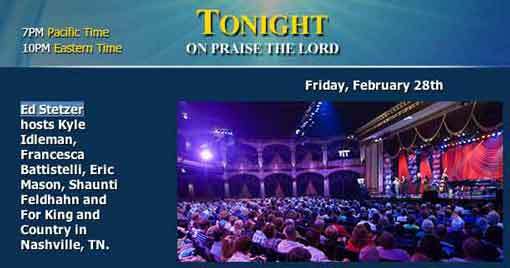 NRB convention participants are being invited to attend the live TBN taping later in the day February 25th. A leading voice in today’s evangelical church, Stetzer is the author of a dozen books and countless articles in such publications asChristianity Today, Outreach Magazine, and theChristian Post. He is also executive editor of both The Gospel Project, a curriculum used by more than 400,000 individuals each week, and Facts & Trends Magazine, a Christian leadership journal with a circulation of more than 70,000 readers. Whatever Ed Stetzer’s motivation, make no mistake, TBN is attempting to piggyback upon his credentials in order to try and paint themselves as an orthodox institution. Finally, considering Francis Chan Declares “I Love Mike Bickle”, I tell you that you have real reason to wonder just how far this phony unity is already stretching.